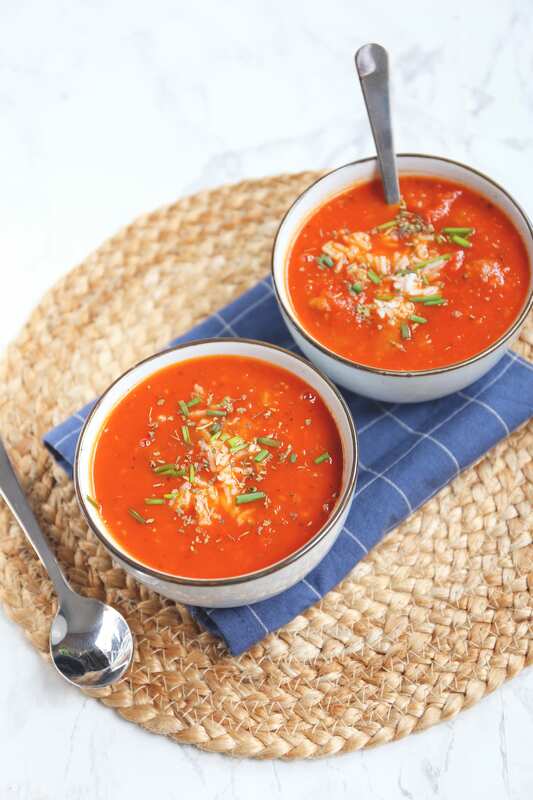 Tomato soup with rice – ready in 30 minutes! Tomato soup is regularly on our table. This time a variation on this, because we have made a tomato soup with balls and rice, tasty, quick and good filling! Can you still use some inspiration for dinner? More soup recipes can be found here! Cut the onion, garlic and tomatoes into pieces. Pour a dash of oil in a pan and fry the onion with the garlic. After a few minutes, add the tomato puree and fry for 1 minute. Then the pieces of tomato, the broth and the herbs can be added. Bring the soup to the boil and let the soup simmer for about 10-15 minutes. Meanwhile, cook the rice in another pan according to the method of preparation on the package. After 10-15 minutes, puree the soup with a hand blender. Put the pan of soup back on the heat and then add the soup balls. Cook the soup for another 5 minutes. Scoop a little bit of boiled rice into two bowls and continue to fill the bowl with soup. Serve the soup with this snack bread, yum!